Sitting just off the coast of South America, the sunny dual-island country of Trinidad and Tobago boasts lush rain forests, white sand beaches framed by palm trees, colorful coral reefs, a diverse array of wildlife, and vibrant cosmopolitan cities. However, the tourism industry here isn't as developed as it is in some other parts of the Caribbean, meaning that even some of the country's most popular destinations can give visitors the exciting feeling that they're travelling off the beaten path. 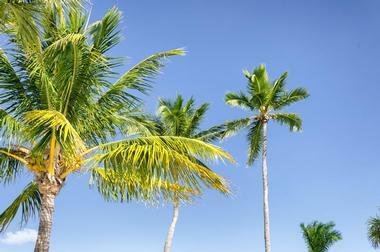 If you're interested in exploring this stunning island paradise, here are the 25 top things to see and do. Part of the Marianne River in Blanchisseuse, the 3 Pools are a great place to visit if you're looking to escape the heat. The three-tiered pools provide something for almost everyone; the water in the first pool is shallow enough to wade in, while the third pool is usually deep enough to be jumped into from the surrounding 15-foot rocks. The first and second pool are connected by a natural rock water slide. The hike to the pools is fairly easy, takes approximately 20 minutes, and can be combined with a hike to the nearby Avocat Waterfall. 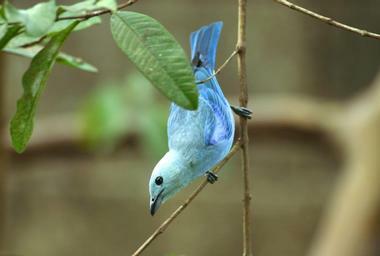 Recognized as one of the country's best examples of sustainable ecotourism, the Adventure Farm and Nature Reserve is a working plantation that doubles as a haven for many different species of bird. Situated on 12 acres of land, the plantation engages in sustainable agricultural practices and grows organic lemons and other citrus fruits. 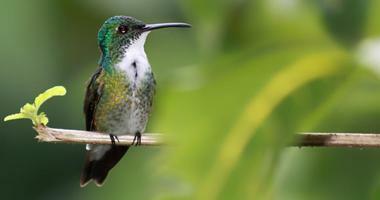 However, most people come here to marvel at the hummingbirds, which flock to the main house at feeding time. Visitors can also stretch their legs on one of the short walking trails winding their way through the estate or head to the nearby Arnos Vale Beach to snorkel and swim. 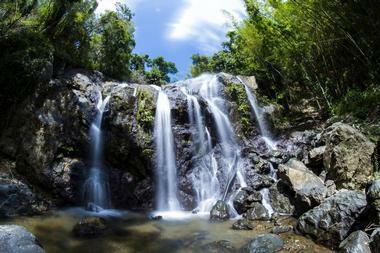 The highest waterfall on Tobago, Argyle Falls is a 175-foot cascade that tumbles down three tiers into a deep pool at the bottom. The walk to the base of the falls takes approximately 15 minutes, but visitors with more time can climb all the way to the third level. The second pool boasts several natural rock pools for hikers to relax in, while the third pool is the best for swimming and is surrounded by vines that make excellent rope swings. 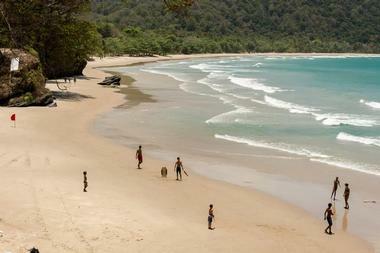 A small entrance fee is charged, and guides can be hired for an additional fee. 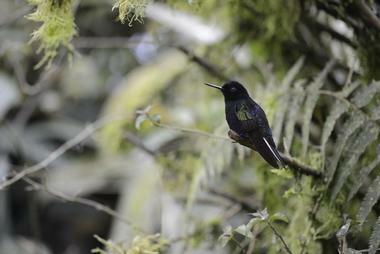 Established in 1967, the Asa Wright Nature Centre was one of the first nature centers in the Caribbean. The center's main facilities are located on a 270-acre former coffee and cocoa plantation, but it also holds almost 1,500 acres of land in the Arima and Aripo Valleys. 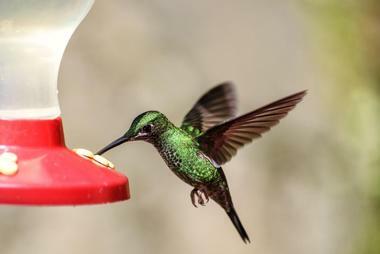 More than 150 different species of birds have been spotted on the center's lands, making it one of the best and most popular bird-watching destinations in the Caribbean. Visitors are welcome to explore the center on their own, but guided nature walks led by professional naturalists are offered twice daily. 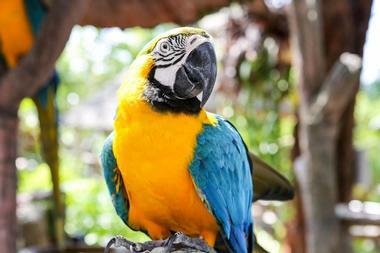 Conveniently located between the Queen's Park Savannah and the Botanic Gardens, Emperor Valley Zoo is the principal zoo in Trinidad and Tobago. The zoo is home to more than 100 animals, including lions, giraffes, a giant otter, a 12-foot crocodile, and various species of monkey. Guided tours are available for groups of up to 60 people, and discounts are offered for tours booked more than 24 hours in advance. Visitors are not permitted to feed the animals, but at specific times of day they can watch as the zookeepers feed the monkeys, giraffes, reptiles, and big cats. 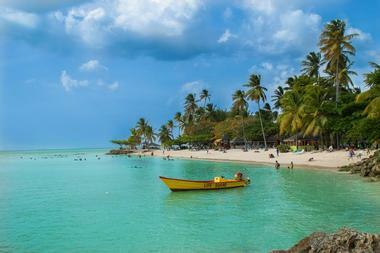 Englishman's Bay isn't as popular as some of the beaches on the western coast of Tobago, but the crescent-shaped beach is arguably the most beautiful in the country. Nestled up against the lush greenery of the rain forest, the beach gently slopes toward the water and is a nesting ground for leatherback turtles. The tranquil blue water is perfect for swimming and snorkeling, and snorkeling equipment is available for rent. Chairs and umbrellas can be rented by visitors who want to lounge on the beach, and there are usually plenty of vendors selling food and local handicrafts. 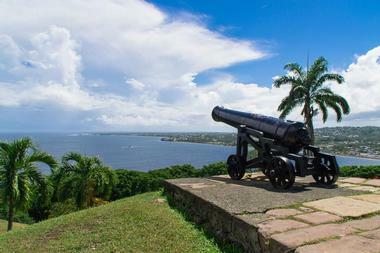 Overlooking Great Courland Bay, Fort James was built by the British during the 18th century to defend the former capital of Plymouth, which is now one of the oldest towns on Tobago. The walls of the fort are made of hand-cut blocks of limestone laid together without the use of mortar, and many are still intact today. 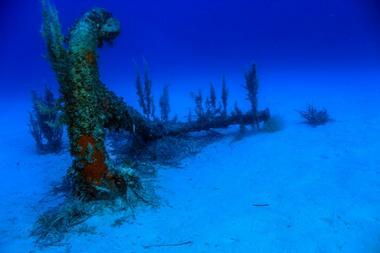 Another highlight includes the collection of four cannons pointed towards the ocean. Today, the fort sits inside a well-maintained park and is an excellent spot for relaxing or enjoying a picnic while admiring the excellent view of the coastline. Sitting on top of a hill overlooking Scarborough, Fort King George dates back to the 1770s and is the best-preserved colonial fort on Tobago. While walking around the grounds, visitors will see the prisoner's bell tank, the officers' dining hall, and several cannons overlooking the water. One of the former guard houses is now home to the Tobago Museum, which displays various Amerindian artifacts, military relics, and other items of interest from the colonial period. However, even visitors who aren't interested in the fort's history will appreciate the breathtaking views of the water, particularly at sunset. 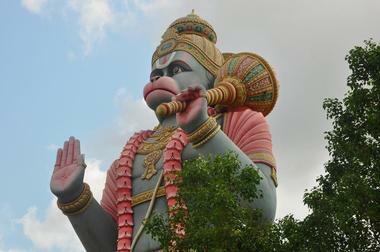 In the Hindu religion, Hanuman is a warrior god who is believed to protect his devotees from evil. As an important disciple of Lord Rama, the god is often prayed to for protection or for the strength and courage to complete difficult tasks. This statue of the god stands 85 feet tall, making it the highest Hanuman statue found outside of India and the second highest in the world. Located at the Dattatreya yoga center in the village of Carapichaima, the statue was built in the Southern Indian Dravidian architectural style and was consecrated in 2003. Also known as Little Tobago Drift, Kelleston Drain is a popular dive spot that is home to the largest brain coral in the world. Composed of millions of individual coral animals, the brain coral has been growing undisturbed for centuries and is now approximately 10 by 16 feet. Although the giant coral is the main draw here, the adjacent coral reef is overflowing with various types of colorful corals that are well worth a look as well. Manta rays can be found here during certain times of the year, and lucky divers might even spot a nurse shark. 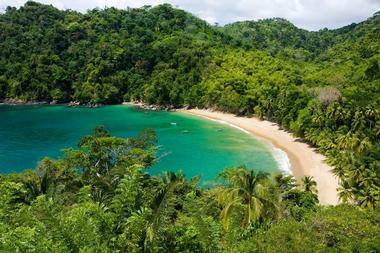 As the only Blue Flag-certified beach in the country, Las Cuevas Bay meets a high standard of cleanliness, safety, and environmental friendliness. 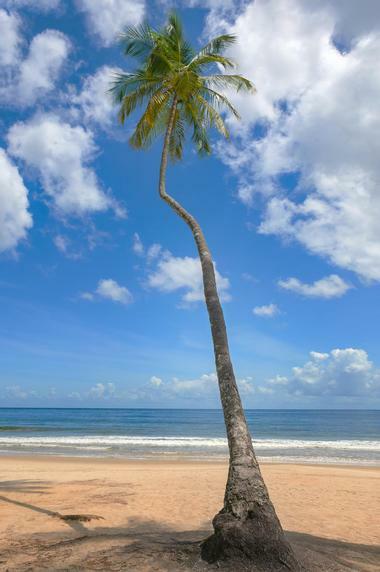 The horseshoe-shaped strip of sand stretches out for almost 14 miles, making it the longest and most popular beach on the northern coast of Trinidad. The waters are calmer than those at the nearby Maracas Bay, making it a popular destination with people who want to swim or relax on the beach. However, decent surfing can sometimes be enjoyed on the western end of the beach, particularly between the months of November and April. Established in 1776, the Main Ridge Forest Reserve is the oldest legally protected forest reserve in the western hemisphere. The Main Ridge is composed of volcanic mountains up to 1,900 feet tall, and it begins at the northeast tip of Tobago and stretches approximately two thirds of the way down the island. Often called the "backbone of Tobago," this area is home to an estimated 16 species of mammal, 24 species of snake, and 16 species of lizard. There are also more than 200 species of birds living here, and a variety of fascinating guided birdwatching tours are available. 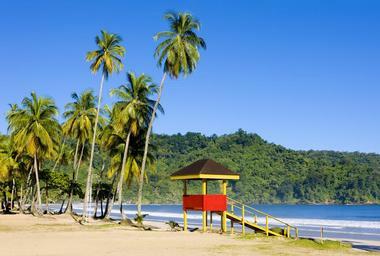 Stretching for 1.25 miles along the north coast of Trinidad, Maracas Bay is easily the most popular beach on the island. With its white sand, palm trees, and blue-green waters, the crescent-shaped bay is the perfect place to relax on the sand and admire the view. It's also an excellent place for surfing; the waves are an average of 3 feet in height, and the water is always pleasantly warm. The beach is also well known as the home of a popular street food called bake and shark, which is sold by a variety of vendors all along the sand. Found at the very end of the North Coast Road, Marianne Beach is the biggest beach in the charming fishing village of Blanchisseuse. Although it begins in the busiest part of the village, the beach gets progressively quieter as you travel down its 1.25 miles of sand. At the opposite end from the village is a tranquil freshwater lagoon, which ensures that visitors have a place to swim even when the sea is too rough. Visitors should be aware that there are no lifeguards on duty here, and the sea has strong rip currents that make it suitable only for more experienced swimmers. As one of the oldest ecotourism companies in Trinidad and Tobago, Nanan's Caroni Bird Sanctuary offers guided boat tours of the Caroni Swamp Bird Sanctuary in Trinidad. All boats are equipped with life jackets, but guests should bring binoculars and a camera if desired. Tours are offered every day at 4:00pm, and guests are advised to pre-book tours over the phone to ensure they get a space. Discounts are available for large groups, and morning tours can sometimes be arranged upon request. 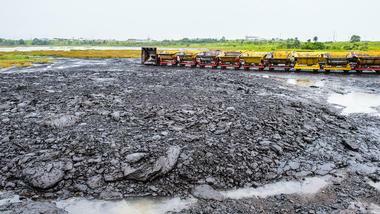 The company can also arrange transportation to the swamp from any hotel in the area. Formerly known as the Royal Victoria Institute, the National Museum and Art Gallery boasts a permanent collection of more than 10,000 items. 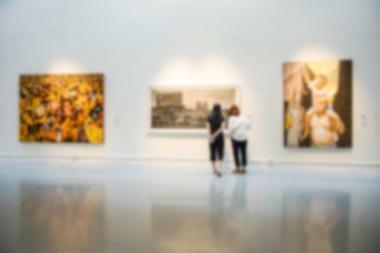 The museum covers a wide range of topics, and most of its pieces are displayed in seven major galleries including an art gallery, an exhibit on the country's economic history, and a geology collection. Another highlight is the 50-seat audiovisual theater, which allows visitors to experience fascinating celebrations of the country's natural and cultural heritage. The museum is open between 10:00am and 6:00pm Tuesday through Saturday, and photography is not permitted in any part of the building. Occupying 125 acres on the southwestern coast of Tobago, Pigeon Point is a peaceful nature reserve with a well-maintained public beach. Swimming is only permitted in the designated area on Main Beach, and lifeguards are on duty here every day of the week. A limited number of beach huts are available free of charge, but chairs and beach umbrellas can be rented as well. Other amenities include restaurants, washrooms, showers, ample parking, and a variety of shops. The beach is open every day between 9:00am and 5:00pm, and a small admission fee is charged. 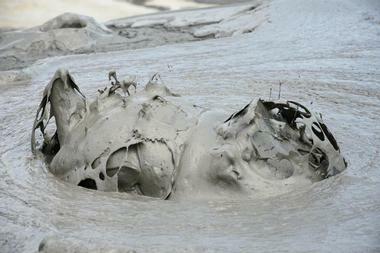 The Piparo Mud Volcano erupted on February 22, 1997, forcing the inhabitants of the village of Piparo to evacuate their homes before the volcano completely flooded them with mud. Most of the village was buried under more than a square mile of mud that quickly hardened to resemble concrete, and the destruction can still be seen to this day. Although volcano is no longer believed to possess any immediate danger, visitors can observe the gray mud bubbling up through several cracks in the ground. There are no signs directing visitors to the site, so it's advisable to hire a tour guide. Spanning approximately 109 acres, Pitch Lake is the world's largest natural deposit of asphalt and one of only three such lakes in the world. Comprising a mixture of water and pitch, the surreal lake is sometimes called the Eighth Wonder of the World. Some spots are solid enough to walk across, while others resemble quicksand and still others are almost as fluid as pure water. A fascinating on-site museum contains various artifacts that have been unearthed from the pitch over the years, including giant sloth bones and an Amerindian bench carved in the shape of an animal. One of the oldest botanic gardens in the world, the Royal Botanic Gardens occupy more than 60 acres of land just outside the Port of Spain. 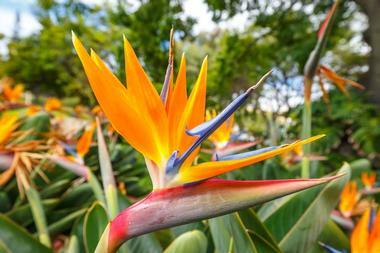 The beautifully landscaped gardens boast more than 700 trees; 13% of these are native to Trinidad and Tobago, while the others have been carefully collected from each of the seven continents of the world. Another point of interest on the grounds is a small burial plot in which the Governors of Trinidad have been buried since 1819. The public is welcome in the gardens every day of the year between 6:00am and 6:00pm. 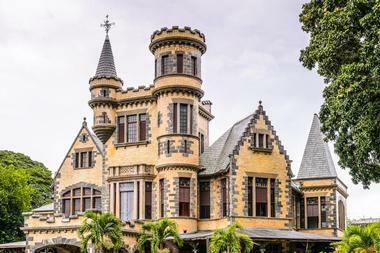 Constructed between 1902 and 1904 by Charles Fourier Stollmeyer, the son of a wealthy asphalt miner, Stollmeyer's Castle is one of the Magnificent Seven Houses located along the western side of Queen's Park Savannah. The elaborate Scottish-style castle is believed by some to have been inspired by Balmoral Castle in Scotland, and is primarily made out of imported brick, Italian marble, and hand-cut blocks of limestone. 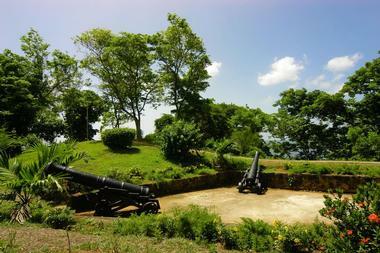 U.S. forces occupied the castle during most of World War II, but it was acquired by the Government of Trinidad and Tobago in 1979 and immediately opened to the public. Composed of coarse golden sand dotted with black volcanic rocks, the beach at Stonehaven Bay lends itself perfectly to sunbathing, taking leisurely strolls, and capturing wonderful photos of your vacation. Excellent snorkeling can be enjoyed on the northern end of the beach, but visitors should be aware that there is a rip current in the water and there are no lifeguards on duty. The bay is also one of the only leatherback turtle nesting grounds on Tobago; visitors are often lucky enough to get a glimpse of the turtles between the months of May and June. Considering the fact that it's located only a 2-minute walk from the ANR Robinson International Airport, it's no surprise that Store Bay is one of the busiest beaches on Tobago. 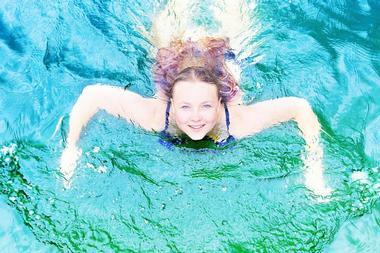 However, the opportunity to swim in the beautiful crystal-clear waters is well worth braving the crowds. The waves here can get quite large, but it's a great place to snorkel when the water is calm. 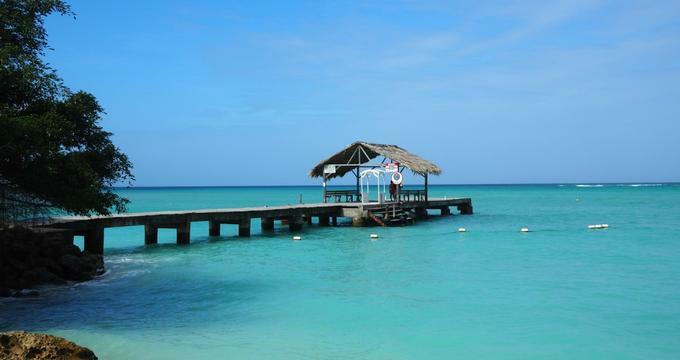 The beach is also the departure point for boat tours to Buccoo Reef, and there is no shortage of vendors renting out beach chairs and umbrellas or selling local handicrafts and snacks. A true testament to the power of the human spirit, the Temple in The Sea was built almost single-handedly by Seedas Sadhu, an indentured laborer from India. 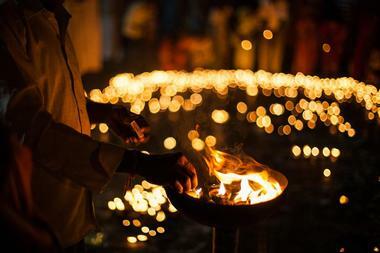 After being denied land to build a Hindu temple, Sadhu spent 25 years unloading buckets of dirt into the sea to create a piece of artificial land and building the temple out of stones he carried through the water on his bicycle. The government decided to help finish the temple in 1994, and today the colorful octagon-shaped building can easily be accessed by a pier that connects it to the mainland. Accessible by glass-bottom boat from both Store Bay and Pigeon Point, the Nylon Pool is a natural swimming pool in the middle of the sea. 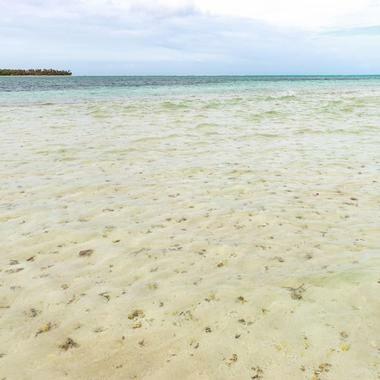 Just over three feet deep, the crystal-clear pool was formed by an off-shore sandbar and is a popular spot for both wading and swimming. Not only is the pool pleasant to paddle around in, but according to local legend, the water has the power to rejuvenate anyone who swims in it. 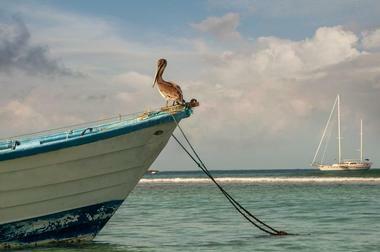 Boat trips to the Nylon Pool often include refreshments, snorkeling equipment, and a stop at the nearby Buccoo Reef.